The perfect environment for the cocoa tree is found int he tropical heat of the equatorial forest. The fertile soil in West Africa provides the majority of the world’s cocoa crop. Cocoa cultivation represents the main source of income for thousands of African farmers. The cocoa tree flowers in 2 cycles of 6 months the whole year round. No more than 40 flowers will develop into cocoa pods. After 6 months the pods are fully grown and have changed color from green to yellow-orange. They are ripened for the main harvest from October to March. A smaller harvest follows, from May to July. After harvesting, the pods are opened up and the pulp, together with the cocoa beans, is removed. 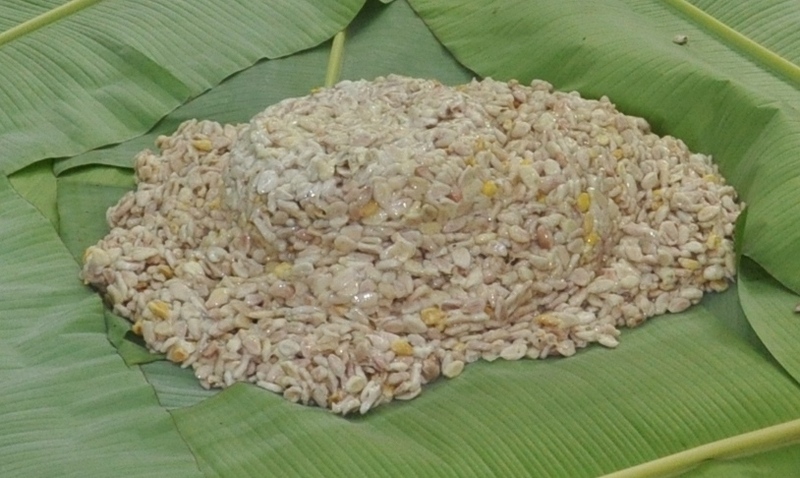 Heaped up and covered with banana leaves, the cocoa beans ferment. In about 7 days, the sugars in the fruit pulp are broken down, establishing the final aromas and color of the beans. After that, the beans dry for about 10 days on raised bamboomats in the full sun. The cocoa farmers bring their precious harvest to a collectioncenter where the beans are graded. From each farmer’s harvest a sample of 100 beans is cut open, the contents of the beans are graded and his batch is allotted a quality code. After the weighing and packing of the beans, the jute sacks are sealed to assure the source and quality of the beans. They are taken to huge warehouses, their origins all registered. After a second quality control the sacks await shipment, or the last interim stage, processing into nibs or cocoa liquor. The cocoa is then sent for storage in the port, to be shipped to a new destination. Jute sacks, filled with cocoa beans, arrive from the equatorial regions of Africa, America and Asia. Cocoa beans of many origins are blended. 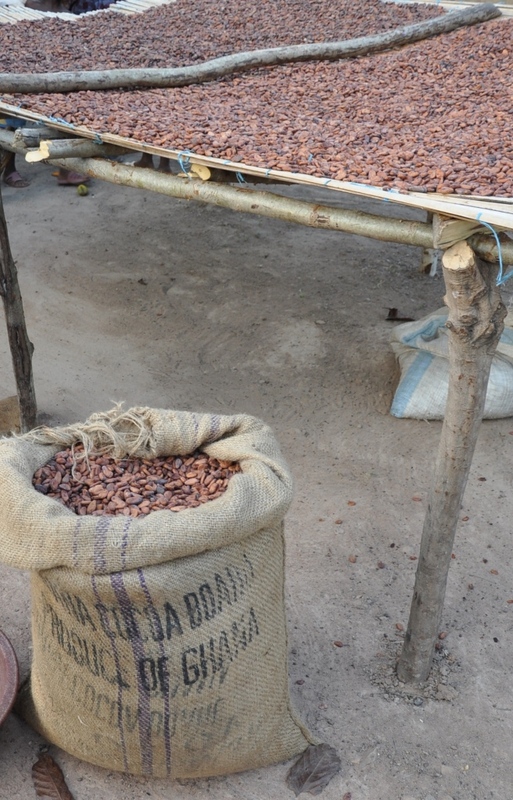 The cocoa beans are cleaned of any stones, dirt and sand and quickly dried under heaters. The cocoa beans are then broken, the shells around them removed. Only the pieces of kernel or “nibs” remain. The cocoa nibs are then roasted, which develops their characteristic aromas. The nibs are finely ground into liquid cocoa liquor. Part of the liquor is stored liquid in heated tanks, the other part is formed into solid blocks. 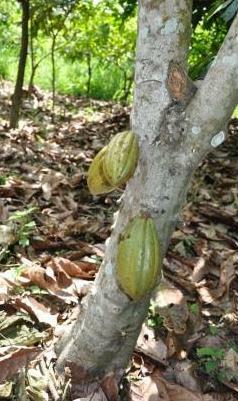 The cocoa liquor is now ready for use as an ingredient of chocolate. Cocoa liquor, cocoa butter, sugar and powdered milk. With these raw materials we can make all of the different types of chocolate. The ingredients are first weighed and then blended into a chocolate dough. This mixture is then pressed between rollers to form a fine powder. This will give the finished chocolate a smooth texture. The chocolate powder is kneaded for hours in the conches, to allow the aromas to develop fully. After this, we add cocoa butter and lecithin, making the chocolate liquid. We form some of the liquid chocolate into tablets, bars, ... In order to achieve this the chocolate has to be pre-crystallised so that it hardens.